Say you’ve been skiing in Sweden and everyone is interested. “What’s that like?” they ask with a sceptical raised eyebrow. Questions range from whether there were mountains (yes) to how much a glass of wine costs 101.33 SEK (£8.50), if we skied in the dark most of the day (no, it stayed light until 8pm) and how handsome the Nordic ski instructors were (as you would imagine, extremely). The truth about skiing in Sweden is that it is completely and effortlessly cool. It is different from skiing in the better-known mountains of Europe because it is so laid-back and seemingly lacking in any effort to be what it actually is, artlessly chic. Our family of six chose to visit Åre, Sweden’s largest and premier winter resort, for a week’s stay in April. In our party were two adults of intermediate ability and four children ranging in age from eleven to sixteen of mixed skiing ability, including a die-hard snowboarder. 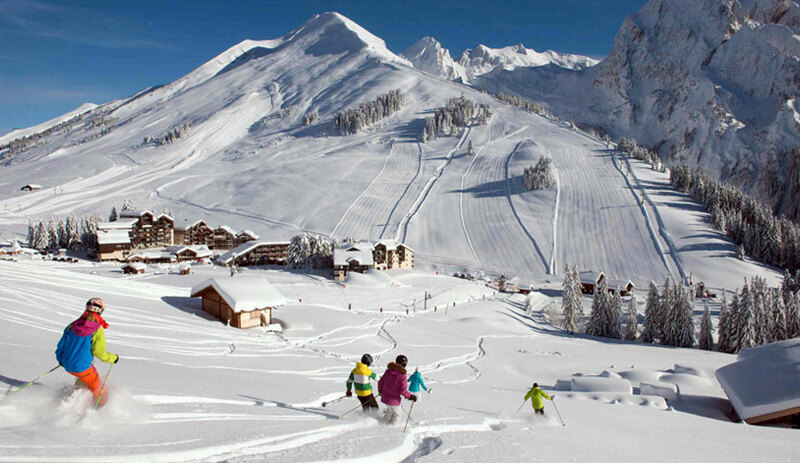 In recent years we’ve got used to the frenzy of the Brit-dominated resorts in the French and Italian Alps. I find it can all be a bit “jostly”. Not so in Sweden. Åre is a resort that works totally efficiently and calmly. Every Swede we met spoke embarrassingly perfect English and was polite, helpful and good-humoured, an attitude that extended to the way they skied. It is almost certainly true that for most of the native skiers the sport was mastered at about the same age as they learnt to walk. There’s nothing showy about the way they bomb down the slopes – and bomb they do; they can be extremely fast – but it is highly stylish. And not for the Swedes the bling of fancy clothing and flash gear. It took a couple of days for me to work out that the accessory du jour – a rucksack with, quite frequently, a rolled-up reindeer-skin rug attached – contained all the components for a slope-side picnic in a dugout snow hole. The smell of sausages cooked on little foldaway Primus stoves will remain my personal Swedish smell-bite. It is claimed that the main skiing area of Åre is big enough to cater for every level of skier, though those of an advanced standard will probably get most thrills from the extensive off-piste guiding available. As intermediates we found the pistes suited us fine. Beginners and younger children tend to stay at Åre’s smaller Duved resort, about six miles west of the main ski area and accessed by bus. The sixty miles of interlinked slopes and the further 112 miles that can be accessed by cross-country skiers are, without exception, Christmas-card beautiful. And, although Åre doesn’t have the neck-craning peaks of the Alps, it still has Mount Åreskutan at 1,420m, reached by a number of open-seated ski lifts and closed bubble cars. The Alpine World Ski Championships were held there in 2007 and the region is bidding to host them again in 2019. Many extreme freestyle skiers base themselves in Åre each season and freestyle jumping by beanie-wearing youngsters is a frequent sight. At the top of its highest run, half a mile or so above the town – where visibility can come suddenly close to zero – the view is of vast plains of snowy slopes that go on for as far as the eye can see. To my mind, the size of most of the pistes seemed extra large. You can traverse for seemingly ages before you need to make a turn, although that’s not necessarily to be advised: Swedish skiers expect you to keep to a tight parallel track.I got wiped out by a very proficient man who simply wasn’t expecting my ski arc to be so large. Still, he very patiently waited and charmingly helped as I recovered all of my ski gear, which had been flung off. Luckily, what I suspect were curses muttered under his breath as he later sped off were, for once, in Swedish. At the top of the mountain are a number of black runs and challenging reds which eventually lead down to gentle blue ski paths lined by snow-frosted pine trees. The ski base overlooks the wonderful dominant landscape of the giant frozen Lake Åresjön, on which helicopters land, cars drive and cross-country skiers walk. For a morning we were fortunate to have the services of a guide from the company SkiStar who showed us all the resort’s back routes and gems such as a Skidoo ride that takes skiers high up into the mountain to a shack serving fresh, hot waffles. Our teenage son wondered why there were so few snowboarders here. The American guide, Brad, tried to be tactful. “Because snowboarders generally have a certain image; they look and act cool,” he said. “Here the Swedes don’t try that hard, it’s not about an image.” Image or not, Swedish style is important, no more so than in the shops and restaurants of Åre. Slope-side, we lunched at the most fabulous hotel and restaurant, Buustamons Fjällgård, which looked like an old converted barn and provided animal skins in which to wrap yourself while on the sunny terrace. The children’s favourite was the 720 Food Station, which served big portions of pasta or the more traditional meatballs with mash and lingonberry jam. Prices are high, although arguably no more so than at comparable restaurants in the Alps. A burger lunch in a stylish restaurant cost around 215 SEK (£18), and fish stew with bread around 170 SEK (£14.50). Alcohol is expensive too, and impossible to buy in the supermarkets, so a duty-free stock-up at a British airport is a worthwhile investment. But if the high prices are a downer for Swedish skiing, there are plenty more ups. Åre may not have mountains as high as the Alps, but snow is guaranteed until the middle of May. When we were there in April, it snowed mostly overnight, making every run powder-soft. In the winter months of December and January, the days are short and cold, but a sophisticated floodlight system on the slopes ensures you can ski until late afternoon. And, by the end of the season in May, it stays light throughout the day and most of the night. Non-skiers also get a good deal. We didn’t even tell our lot about the popular attractions of the area, which include husky dog-sledding, tobogganing, paragliding and Skidoo trips across the frozen lake. If we had mentioned them, we might never have got them back in their ski boots. So, to the last question most people ask when we wax lyrical about our new-found Scandi ski passion: would we go again? An unequivocal yes. Sweden is undoubtedly expensive but it is a fantastic option for British winter-sports enthusiasts looking for something a bit different and away from the usual ski crowd. Four years ago Åre was voted by Condé Nast Traveller magazine as one of the top ten places to ski in the world – a surprise to many, as it is largely under the European radar. But, having been, I now completely understand why. When it comes to skiing, cool Swedish style has never been so fiercely hot. FIONA KNIGHT is a travel writer at The Telegraph.